Since artistic success is defined by individual talent, or merit, the CCIs should be one sector that is especially open to, and appreciative of, social diversity in terms of race, class, cultural group and gender. However, recent studies in both the UK and the US have revealed that employment in the CCIs is heavily dominated by middle class people, and is not nearly as diverse in terms of other characteristics, which is what had been expected. Since the advent of democracy in South Africa in 1994, transformation of firm ownership, previously dominated by white people, to include more black, coloured and Indian/Asian-origin South Africans, has been an important part of achieving greater economic equality and social cohesion, as well as being more representative of the cultures of the majority of the population. This study, therefore, investigates to what extent the CCIs in South Africa are moving towards more inclusive and racially diverse patterns in their ownership and employment profiles. Using a survey of 2400 randomly selected CCIs, it compares ownership and employment patterns across the six UNESCO (2009) Cultural Domains to determine their contribution to black economic empowerment (transformation) within the various domains. In terms of ownership, CCI firms in South Africa showed quite a lot of variation across the different Domains (Figure 1). 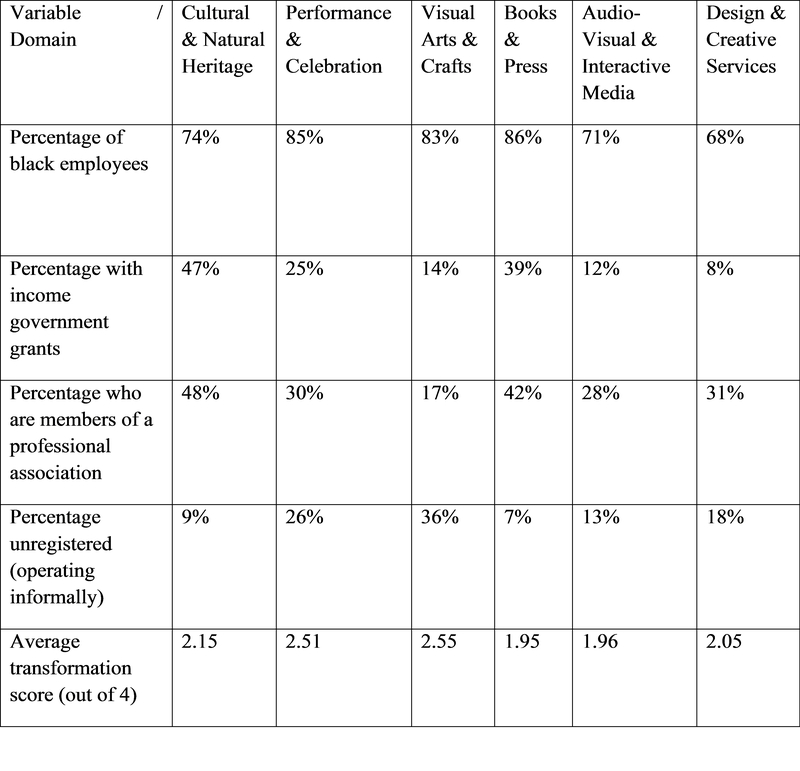 Firms who had at least one black (meaning black African, coloured or Indian/Asian person) owner varied from 65% for Performance and Celebration to 44% for Books and Press. Firms with at least one woman owner varied from 31% (Audio-Visual and Interactive Media) to 58% (Visual Arts and Crafts). Youth (up to 34 years old) ownership was most prevalent in Performance and Celebration (45%) and least likely in Books and Press. 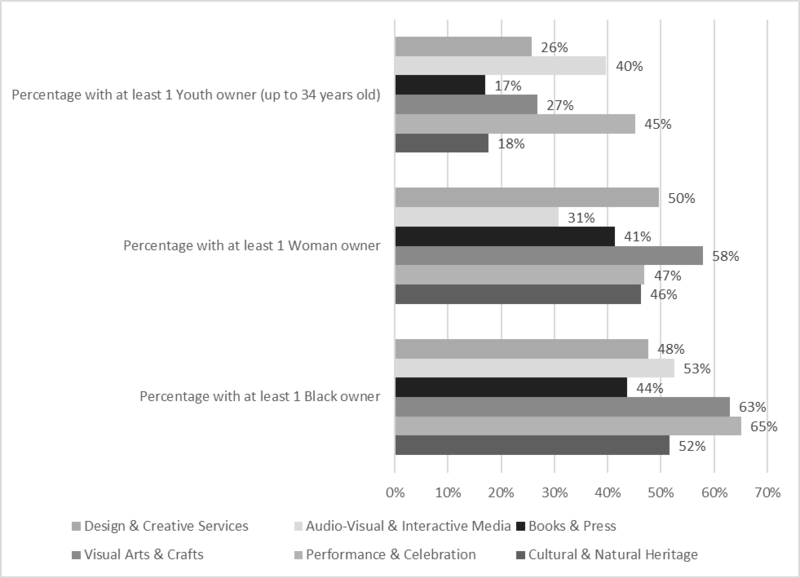 A pattern in CCI ownership begins to emerge: More commercial sectors, such as Books and Press, Audio-Visual and Interactive Media, and Design and Creative Services, are less likely to have at least one black owner and at least one female owner. Less commercial sectors, especially Performance and Celebration and Visual Arts and Crafts, tend to be more diverse in terms of ownership. To be representative of the labour force, black ownership should be at least 66%. Only Performance and Celebration and Visual Arts and Crafts achieve this level. As found in other studies of the CCIs, a higher proportion of employees in this sector had completed tertiary education than in the general working population. This was especially the case for Audio-Visual and Interactive Media, Books and Press and Design and Creative Services. Employees in these sectors were also more likely to have completed formal, certified industry training than employees in other sectors. This might go some way towards explaining why these more commercial sectors are also those with the lowest levels of racial diversity: a much higher percentage of black South Africans are in the low-income households, which constrains access to good quality school and higher education. A significant proportion of employees in the sector work on a contract or part-time basis. However, this varies dramatically across Domains. For example, the vast majority of employees in Cultural and Natural Heritage (88%) and Books and Press (81%) are full time workers. However, Audio-Visual and Interactive Media employees are mostly working on contract (55%), and more than half in Performance and Celebration are working on a part-time or contract basis. Domains with the highest percentage of firms who receive financial support from local, provincial or national government were Cultural and Natural Heritage (47%) and Books and Press (39%). The more commercial “creative” industries (Audio-Visual and Interactive Media, and Design and Creative Services), which also have the highest average turnover, receive fewer grants. A “transformation score” was constructed for each firm that took into account ownership and employee demographics. With the transformation score as the dependent variable, a regression was run to determine what the characteristics of firms with a high transformation score were. 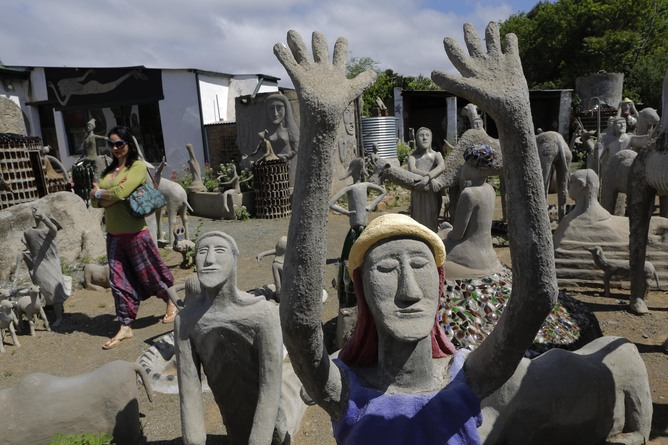 More transformed firms were more likely to be in the Visual Arts and Crafts sector, be receiving some form of government grant, be operating in the informal sector, have younger owners, and were not members of a professional association. Thus, it is possible to conclude that CCIs are making some contribution to ownership and employee transformation in South Africa. However, the ownership and employment profile of firms in most UNESCO Domains are still not representative of the labour force make-up of the country. There is also evidence that firms with a higher percentage of black owners and employees and female owners (that is, a higher transformation score) are struggling most, although they are more likely to be receiving some form of public support. Table 1: CCI Firm Characteristics. Snowball, J., Collins, A. and Tarentaal, D. (2017) Transformation and job creation in the cultural and creative industries in South Africa. Cultural Trends. Pages 1-15 | Published online: 29 Sep 2017. http://dx.doi.org/10.1080/09548963.2017.1380706. Jen Snowball, Professor, Department of Economics, Rhodes University, Grahamstown, South Africa; Researcher: South African Cultural Observatory.